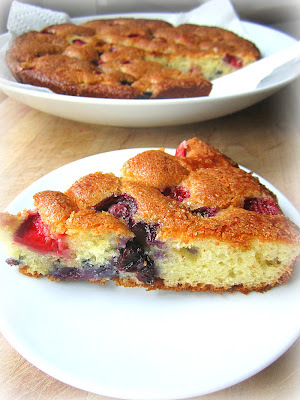 Berry Yogurt Cake & a Giveaway! 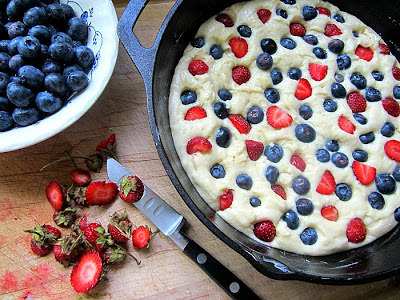 This is a berry good cake. Blueberries are in season NOW, as are strawberries, so come and get 'em. This is a no fuss cake, and so simple and delicious. 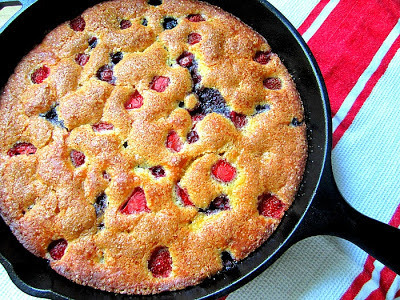 You will want to keep making this until the berries run out. The original recipe calls for baking the cake quickly at 400F, but since I made mine in a cast iron skillet and my oven runs on the hot side (as do I), I turned down the heat to 375F with excellent results. You can use blackberries, raspberries and/or any other berry you like. Knock yourself out. This is not that fattening, since it only uses half a stick (4 tbsp) of butter and has healthy Greek yogurt in the mix. The yogurt makes the cake moist and rich tasting. Very delicious for breakfast or after school snack (school's over, I know). Preheat oven to 400°F with rack in the middle. Butter a 9-inch round cake pan and line the bottom with parchment paper. Flour the sides. (I used a 9" cast iron skillet, well buttered and well seasoned). Whisk together the flour, baking powder, baking soda and salt in a medium bowl and set aside. Place the granulated sugar and lemon zest in the bowl of a stand mixer or in a large mixing bowl. 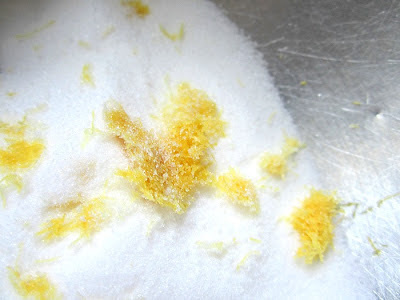 Using your fingers, rub the zest into the sugar until it is the texture of damp sand and smells like lemon candy (how do you like that one?, but it does smell so nice when you do it this way!). Add the butter and beat in a stand mixer or with an electric mixer on medium-high speed until pale and fluffy, about 3 minutes. 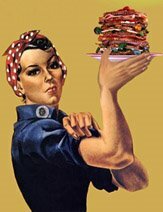 (I always use my muscles, but am telling you what the original recipe says). Beat in the vanilla and the egg. Add the yogurt and beat well. Beat in half the flour mixture until just combined. Then beat in the milk and remaining flour mixture. Spread batter evenly in the pan. 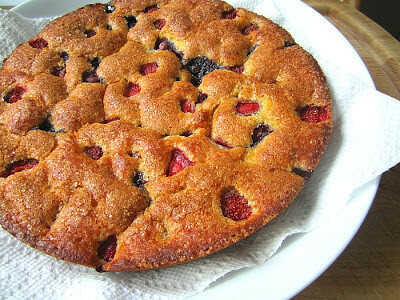 Scatter berries over top and sprinkle evenly with turbinado sugar. Bake until cake is golden-brown and a tester inserted in the center comes out clean, about 25-30 minutes. Let cool for 10 minutes in the pan, then turn out onto a rack and cool for 10-15 more minutes. Remove parchment and invert onto a plate. and since June is National Dairy Month (woo hoo!)........... 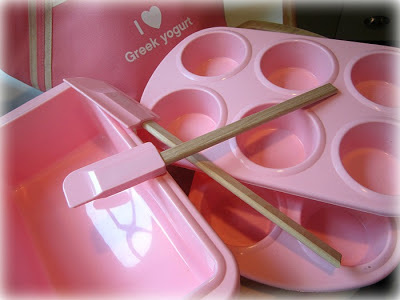 for all you Greek Yogurt fans, I am giving away one set of pretty in pink silicone bakeware, consisting of 2 spatulas, 2 loaf pans, 2 muffin pans, a cute "I LOVE GREEK YOGURT" apron and a thermal travel lunch pack! Just leave a comment (no anonymous comments, duh), telling me what you like about Greek yogurt, and the winner will be chosen on July 5. Always love you blog. Will make the cake for weekend guests today. Have tons of Grrek yogurt, since I eat plain yogurt with fresh fruit, or yogurt fruit smoothies every day for breakfast. What I like best about Greek yogurt is its versatility. 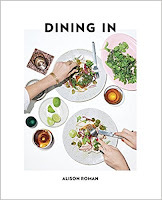 You can use it 'as is' with fruit, granola or nuts for a great breakfast or lunch. But I often use plain Greek yogurt as a substitute for mayo and sour cream in sauces and dips. Plain Greek yogurt and sirachi makes a great spread for turkey burgers. Sounds yummy and like that is lower in calories. And we have a container of non fat yogurt waiting to be used. As I am also watching my weight lately, I have found a non fat Greek yogurt in the am keeps me full til lunch time. I am actually eating it now. Keep the yummy recipes coming. By the way, the kale cole slaw was delish! I like how tangy it is and the thicker consistency. I could never eat plain yogurt before, but once I tried greek yogurt I was hooked! Greek yogurt is so thick and creamy. I usually get non-fat plain yogurt so whenever I eat the Greek kind, I feel like I'm eating some decadent dessert. I love the sharp taste and the thickness of Greek yogurt. Plain, no-fat Greek yogurt is all I buy. Stacey, I know you're plugging the Greek yogurt here but do you think this cake would work if I substituted the yogurt with buttermilk? I'm on a buttermilk kick lately. Love the way yogurt makes baked goods a little bit better, it also makes us feel we are having something that's not healthy when mixed with fruit, umm good. You can use any kind of yogurt you like, and I think buttermilk would be GREAT in this cake! I love plain Greek yogurt with honey and toasted walnuts for breakfast. And I really like plain green yogurt with lemon and garlic to go with salmon or on top of risotto cakes for dinner. Well, now it's decided. I'm 40 weeks pregnant this Sunday and I've been looking for a delicious and easy breakfast/snack item to whip up this weekend and have on hand for visiting guests next week. This is perfect! Now hopefully this little girl can hold out in here long enough for me to make it! Thanks, Stacey! I love this cake Stacey, I'm going to make it tonight! I always have fresh berries and greek yogurt around which I have for dessert often. My favorite greek yogurt is always the plain full fat kind, Trader Joes brand is fantastic and also from Whole Foods I like The Greek Gods brand. Two tablespoons is all I need. I am currently sharing a cabana space at the beach with a dear friend who is separated and has two girls whom are in his custody every other week. Last week, the older of the 2, a picky eater, asked her dad what was for dessert. As my buddy didnt really plan for it, and as I had brought some Greek Yogurt to make a filling for pappadews, I whipped up a dessert of yogurt, some lavender honey (which was in the cabana as well) some shaved almonds and some boiled down balsamic vineger. She loved it. That's what I love about Greek Yogurt!!! A happy 13 year old! I'm coming out of hiding to tell you that this is almost the same cake that I told you I made the other day. Greek yogurt is the best! Once you've had it you can never go back to regular yogurt. I think I just found Sunday's new dessert recipe! I love greek yogurt! Once you've had it you can't go back to regular yogurt. I think I just found my new dessert recipe for Sunday! I love Greek yogurt, especially mixed with berries and other fruit. As I'm trying to loss weight it makes a great healthy dessert. Very tasty! The cake looks great, perfect for summer. I love the rich, satiny mouthfeel of Greek yogurt. And I find it is especially good in baked goods, adding a richness lacking in other yogurts. I love your recipes! As a matter of fact, I am making your classic Potato Salad right now for a bbq we are going to tomorrow! Anyway, I love GREEK yogurt for so many reasons. My latest creation is using the non-fat (I like Wegmans brand) combing it in the food processor with some avacados, cilantro and some adobe peppers! YUMM I put that sauce on everything!! I make mushroom spinach wraps, and that is my sauce! It goes over my tacos, pork tenderloin, boring chicken breast. I love it!! Plus I LOVE the Greek I am married to!!! :) He's too adorable!! I like including yogurt in pestos/no cook sauces to thicken and make creamy and delish. It's the best substitute for sour cream in recipes, which is something I almost never have around. I always have Greek Yogurt! Two thumbs up for multi-purpose dairy! Thanks for all of your recipes, Stacey! I need to figure out what to make with my set of silicone liners! Loving this cake. Bet it tastes like summer! It's great for other things besides eating directly out of the container. I like to mix it with parmesano and coat pieces of chicken with it before baking. Oh, boy, what a delicious dish! I used the 'original' recipe last week after Googling lemon-yogurt-blueberry cake. Delicious! It was a hit at the party I took it to, especially with the lemon curd whipped cream. Yum! I used plain yogurt, not Greek, and no milk. You are so funny! Don't use a mixer? Wow. I make my own "Greek" yogurt every week....from 2 gallons of fresh cow's milk....for my dogs. What I love about Greek yogurt is its richness and all the fat! Yep! I love how creamy it is. It's a luxury. That cake is just in time for the 4th of July! Love the red, white and blue. Polenta topped with greek yogurt and basil pesto. Greek yoghurt tastes the way I remember yoghurt tasting when I was a child and before I grew up, gained weight on my 51 year old body and started eating zero fat yoghurt. Even the 1.5 % yoghurt tastes delicious and is so creamy. I'll never go back to the other! I like Greek yogurt. It is really good with fresh fruit. This cake looks delicious. 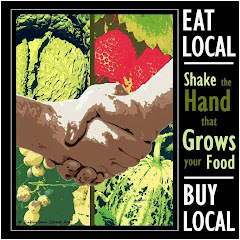 I love eating local berries. They are so good. Thanks for the giveaway. In April I started really watching my weight. 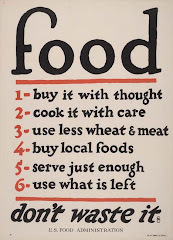 After losing 10 lbs on the wheat belly diet, I changed my eating habits to eat the way people in the Mediterranean eat. I eat fresh only - fruits, vegetables, lots of chicken and fish in a variety of ways. One of my favorite snacks is greek yogurt (I buy Trader Joe's European Style) with a drizzle of honey from our hives and either toasted quinoa or toasted nuts. I love the tangy flavor of the yogurt. In addition to this snack, I also use greek yogurt to make salad dressings - tangy yet flavorful with the different spices I may add to it. As athletes, I'm always trying to add protein to our day and greek yogurt is one delicious way to do that! Thanks for a great blog! I love how the tart flavor is so versatile and pairs wonderfully with anything sweet. I love Greek yogurt! I eat it daily with fresh fruit, seeds and nuts. My DH eats it with homemade granola. I can't eat oatmeal! I also love to use it as a replacement for sour cream and it's great for baking. Whoopa...........Just love my Greek Yogurt. Chobani is the very best. I'm definitely going to try this berry cake. Looks delish. I love Greek yogurt because it's so rich and creamy. I like Greek yogurt as healthy substitute for high fat things like mayo and sour cream. I love the creaminess and versitality of Greek yogurt! 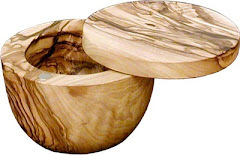 I use it in sauces, baking and out of the container with fruit. I love to make a marinade for meat with Greek yogurt. i like, that greek yogurt is so creamy! I will be making this "up north" this week! It's my kind of cake. I love Greek yogurt because, Once Upon A Time I had a recipe I always made that called for yogurt cheese. Yogurt cheese is what you get when you take regular plain yogurt, place it in a cheesecloth lined sieve and allow the water to drain out overnight. Then you get this lovely thick yogurt. One day while shopping at The Market Basket in Franklin Lakes, NJ I happened to discover Fage Greek yogurt and realized it was this same lovely thick yogurt that would take me overnight to make. I can't tell you how thrilled I was. That was about 4 years ago and I keep Fage Greek yogurt in my refrigerator now at all times and also use it as a replacement for sour cream in all my recipes and even on my baked potatoes. I just love it!!! I love Greek yogurt because it's creamy and soft and goes well with everything! This is my first visit to your blog--definitely seeing some things I want to try! 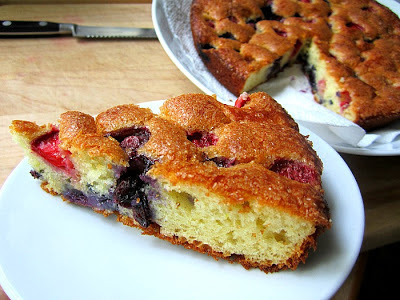 I like the texture of Greek yogurt and the tang it gives baked goods...like this cake which I think I will make this week! I love Greek yogurt. I use it to bake and for savory dips. I wish I would have found it sooner. Greek yogurt is one of the best inventions EVER. My fave brand is NOOSA! My only complaint is that they only have 6 prime flavors! Whether its a fruity variety in overnight oats or topped with granola or a cool topping for fish tacos or grilled salmon or a thickener for soups, I love Greek yogurt's nutritious and delicious versatility! Anything and everything with Greek yogurt is GREAT! Love the thickness the best. And LOVE your blog the best !!! 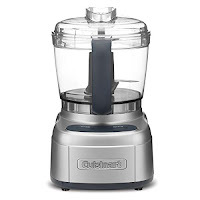 Have used many of your receipes - thanks! No more sour cream or mayonnaise for me. I've found Greek Yogurt and I LOVE everything about it! I like that Greek Yogurt has more protein than other yogurts.